- Dr. Reina Roa accepted the GSP Award to a Governmental Body on behalf of the Ministry of Health in Panama for leadership and commitment to further smoke-free policies by a governmental agency. 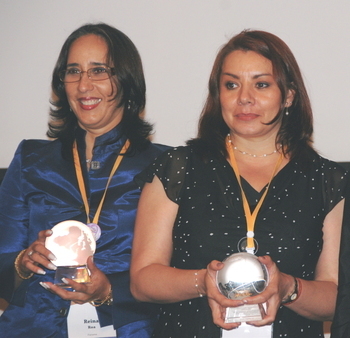 - Dr. Sonia Meza accepted the GSP Award to Civil Society and Campaigners on behalf of the Interamerican Heart Foundation Mexico for outstanding and sustained action to promote smoke-free policies. - Hemant Goswami received a GSP Extraordinary Award for exceptional and outstanding commitment by a dedicated smoke-free and tobacco control activist to promote the implementation of the guidelines on Article 8 of the Framework Convention on Tobacco Control (FCTC). - Dr. Prat Boonyawongvirot, the Permanent Secretary of the Ministry of Public Health of the Kingdom of Thailand, accepted a GSP Extraordinary Award on behalf of the Ministry of Public Health for an exceptional example of how governments effectively implement the guidelines for Article 8 of the FCTC. Dr. Boonyawongvirot accepted the award at a press conference held at the conference venue. ma gandesc ca pot sa scriu si in ranmoa, nu? ok uhm nu prea inteleg faza cu LIVE streaming ca tot ce pot sa vad pe site sunt filmuletze difuzate mai de mult pe post dar nici urma de video LIVE asa ca nu inteleg cei asa tare la site/post .. sau tre sa faci un cont pt asta? At home or across the globe, learn how you can fight back against cancer!